Friday 2 October 2015 saw the return of the annual Open Mic Night at After Hours Live, situated in the picturesque Octavia's Cafe in Wisbech. The event saw many talented performers take to the stage for a 10 minute slot where they entertained the audience with a wide variety of acts including comedy, poetry and music. 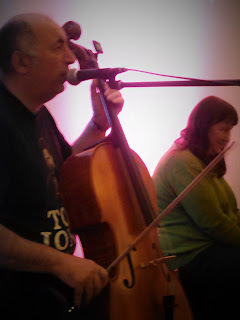 Some of the highlights included a rendition of the Tom Jones classic 'Kiss' on a cello by Pam and Alan Vibral. Acoustic original songs by Alex Chapman that contained a Johnny Cash vibe were another highlight of this fun-packed evening. After Hours Live is back on Friday 6 November where talented singer Rachel Yvonne will be travelling up form London to give us an evening to remember. Please visit the After Hours Live website for more information.